Six Solis Ortus athletes competed in the 2nd Samurai Cup on Saturday 15 September 2018 at the Beaulieu College School Hall, Kyalami. This tournament was hosted and particularly well organized by The Russell Sim Karate Academy and Midrand Martial Arts Academy. With no exception we stand proud yet again in our young athletes’ performances and achievements this past weekend. Solis Ortus brought home 11 medals in total. 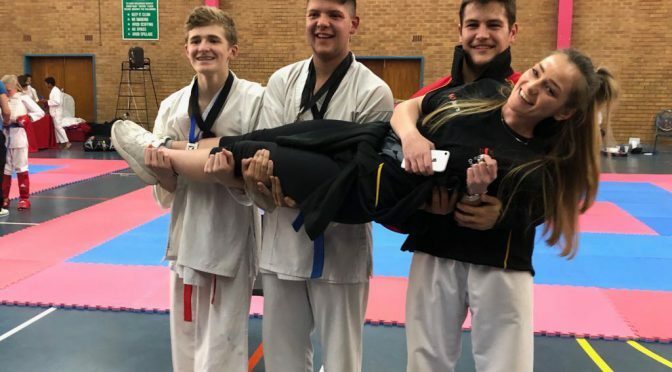 Our young athletes achieved double medals in both events; kata and kumite; 4 gold, 5 silver and 2 bronze; and unfortunately 1 student missed out on a double medal. Well done to our stars Ethan Brazille; Pieter Jordaan; John-Henry du Toit; Drian du Toit; Drew Dupuy and Darius Peenze. We are tremendously delighted in your karate journey and cannot wait to see what happens next. “Every day focus on your purpose. We don’t get burned out because of what we do. Eight Solis Ortus karatekas arrived bright and early at the Portuguese Hall in Johannesburg on Saturday morning, ready to ensure their place in the KSA Development team, competing in Durban early October 2018. From our youngest, 4 years old to our oldest 23 years old, we only expected great results. As always our karatekas surprised us, and we can only stand in admiration how they have grown as athletes, to withstand the pressure they experience by stepping onto the tatami’s and only give their best. There were two divisions; Development where children of the same belt and age competed against each other; and the Development Opens, where all belts of same ages competed. Only the first 4 places in the Opens division that qualified will compete in KSA Development in Durban on 6th October 2018. We are proud to announce that 3 of our karatekas achieved their places: Jayden van der Merwe (7 years old), Strauss Vosser (9 years old) and Tiaan Uys (23 years old). Always remember that winning is about attitude. A winner is a person who goes out today and every day and attempts to be the best athlete and best person he or she can be. Winning is about determination, effort and self-assurance, and to never, ever, ever giving up. Well done to all our competitors. Solis Ortus is extremely proud of you all and cannot wait to see how you all develop in great sport men and sport women one day. We are especially proud of our 3 athletes who qualified for the KSA Development team. In total Solis Ortus achieved 9 medals of which 3 are gold, 2 silver and 4 bronze. We would like to congratulate 5 Solis Ortus (SO) athletes who competed this weekend at the Portuguese Hall, Turffontein. They are PW Pentz, Drew Dupuy, Lolly Constable, Thirq du Preez and Pieter Jordaan. Yet again you accomplished your milestones and arose with 4 medals; 1 gold, 1 silver and 2 bronze. Weigh in took place on the Friday and the competition commenced on Saturday morning. As always we had a formidable SO team who came out tops with hardship, bruises, shiners and other small injuries. Well done everyone, we are proud of our young athletes who are stepping into a fantastic karate journey, full of good memories and phenomenal experience. The KSA Selection Panel will select athletes to represent South Africa at the Commonwealth Games after the final KSA League this weekend. They stated that it is not necessarily the top 4 ranked athletes that will be selected for the team. It will be used as a guideline together with other factors will be taken into consideration to select the final team. Good luck to all our SO athletes, we cannot wait to see how many club karatekas will be honoured with the selection to represent South Africa at the Commonwealth Games. You all have shown good character and the ability to rise above adversity. Keep on doing what you’re doing and you will become the best of best in what you do. Well done to all our champions, we are extremely proud of you all.